In 1954, Hurricane Hazel swept through Toronto with unparalleled force. Although Toronto is no stranger to flooding—the first written account of a flood was in 1797—many were unprepared for the devastation this storm caused. Hurricane Hazel made its way to Ontario on October 15, 1954. Within 24 hours more than 200 millimetres of rainwater had fallen over the city. The Humber River and Etobicoke Creek watershed as well as Holland Marsh were the most affected bodies of water. These areas began to overflow and an excess of rainfall destroyed communities, roads, parks and public utilities. As a result of the storm, 81 people lost their lives and thousands were left homeless. It is estimated that a storm of this magnitude today would cause nearly $1 billion worth of damage. Why is Most of Toronto at Risk of Flooding? Urban areas are at risk of flooding because they are typically formed around lakes, rivers and harbours. Extreme weather conditions such as heavy rainfall, hurricanes, melting snow and ice are the most common causes of flooding in a city. Increased urbanization also contributes to flooding in cities – especially here in Toronto where the Don River holds the record as one of the most urbanized watersheds in Canada. As a city develops, the ground gets covered in concrete, pavement and other materials that prevent rainwater from seeping into the soil. This causes excess water to runoff into rivers and lakes. We can mitigate the chance of flooding by creating more naturalized spaces in the city where rainwater can be absorbed and filtered back into the earth. Toronto and Region Conservation (TRCA) has mapped out the areas in our city most vulnerable to flooding. Knowing which areas are at risk can help us determine where to build new homes and businesses. The parts of our city that were developed before the region’s floodplains were mapped out must find ways to lessen their chances of flooding. 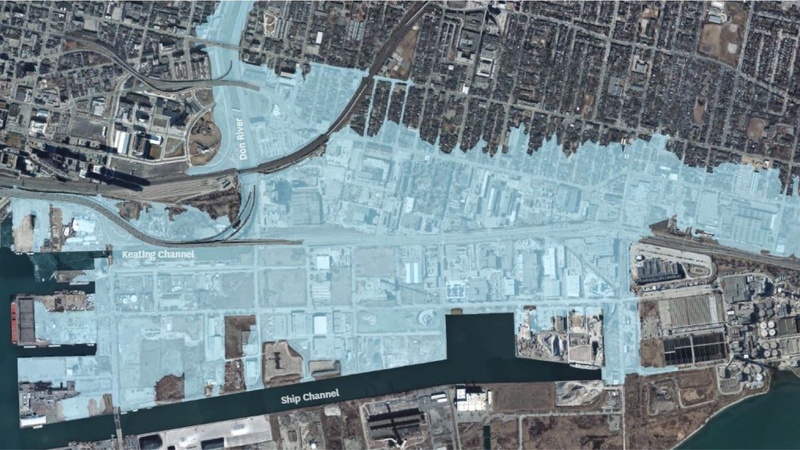 That’s why the Port Lands Flood Protection Project is so important: 290 hectares of Toronto’s southeastern downtown currently sit in the floodplain of the Don River. This graphic shows the area at risk of flooding from the Don River. Once flood protection is complete, a vast stretch of land within a 15-minute bike ride from central downtown will become a place where we can build new homes, public spaces and parkland, allowing the city to expand in a sustainable way.